Download "RULE. Office of the Governor Real Estate Appraisers Board. Appraisal Management Companies (LAC 46:LXVII.Chapters 301-309)"
3 4. a copy of any corporation, partnership, or limited liability company registration certificate issued to the applicant by the Louisiana Secretary of State. E. When an applicant has made a false statement of material fact on an initial license application or in any related document submitted therein, such false statement may in itself be grounds for refusal of an initial license. F. If the board denies an application for initial licensing, the applicant shall be notified in writing and shall be afforded an opportunity for a hearing before the board to show cause as to why the application should not be denied. 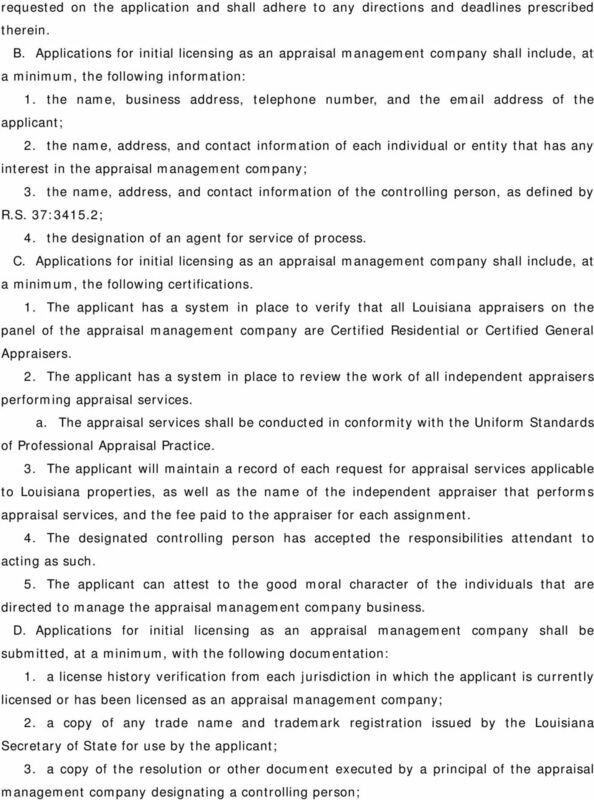 G. If the board determines that an applicant has satisfactorily met the prescribed requirements for initial licensing, a Louisiana appraisal management company license shall be issued to the applicant. H. Initial licenses shall be issued for a period of 12 months and shall expire one year from the date the initial license is issued. Conducting any activity authorized by the license after the date of expiration shall be deemed a violation of this Chapter. 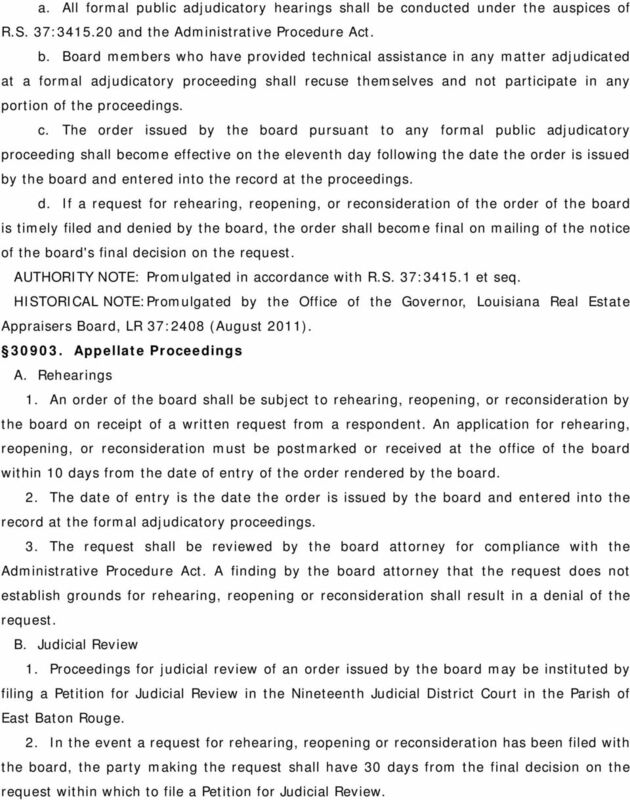 Appraisers Board, LR 37:2407 (August 2011) License Renewal Applications A. Each appraisal management company license shall be renewed annually. Timely submission of a renewal application shall rest solely with the licensee. B. The renewal application shall be in such form and detail as prescribed by the board and shall be accompanied by all documentation requested therein. Applicants for a renewal license shall adhere to all directions and deadlines prescribed within the application. C. When an applicant has made a false statement of material fact on a license renewal application, or in any related document submitted therein, such false statement may in itself be grounds for refusal of a renewal license. 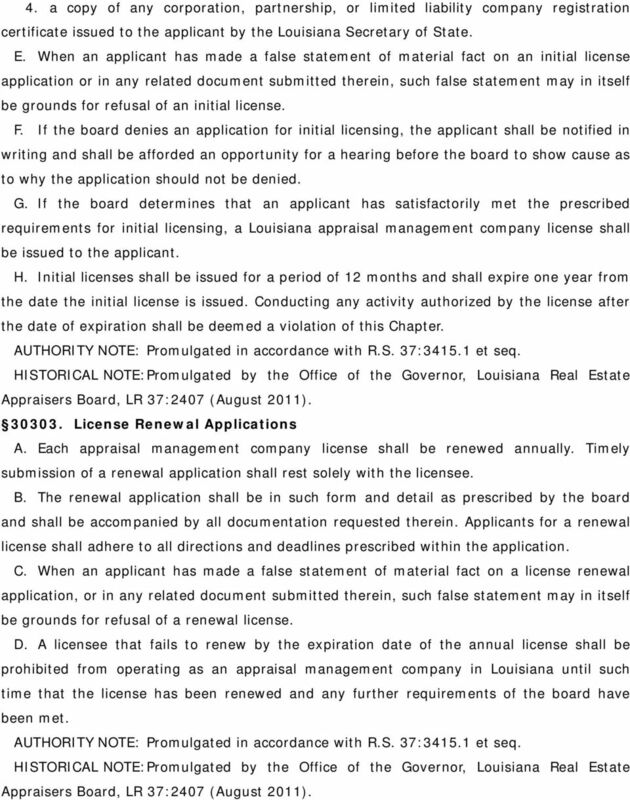 D. A licensee that fails to renew by the expiration date of the annual license shall be prohibited from operating as an appraisal management company in Louisiana until such time that the license has been renewed and any further requirements of the board have been met. Appraisers Board, LR 37:2407 (August 2011). 5 3. altering, amending, or changing an appraisal report submitted by a licensed or certified appraiser by removing the appraiser s signature or seal or by adding or removing information to or from the appraisal report; 4. removing an independent appraiser from the appraisal management company s panel without prior written notice that includes supporting evidence that: a. the appraiser has acted illegally; b. the appraiser has violated the Uniform Standards of Professional Appraisal Practice, or other applicable state statutes or rules; or c. the appraiser has had substandard performances or otherwise acted in an improper or unprofessional manner. 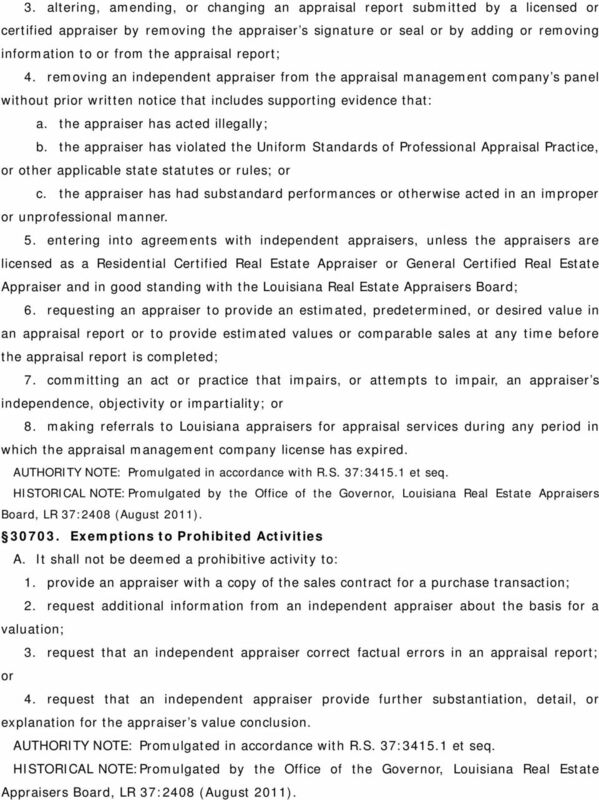 5. entering into agreements with independent appraisers, unless the appraisers are licensed as a Residential Certified Real Estate Appraiser or General Certified Real Estate Appraiser and in good standing with the Louisiana Real Estate Appraisers Board; 6. requesting an appraiser to provide an estimated, predetermined, or desired value in an appraisal report or to provide estimated values or comparable sales at any time before the appraisal report is completed; 7. committing an act or practice that impairs, or attempts to impair, an appraiser s independence, objectivity or impartiality; or 8. making referrals to Louisiana appraisers for appraisal services during any period in which the appraisal management company license has expired. 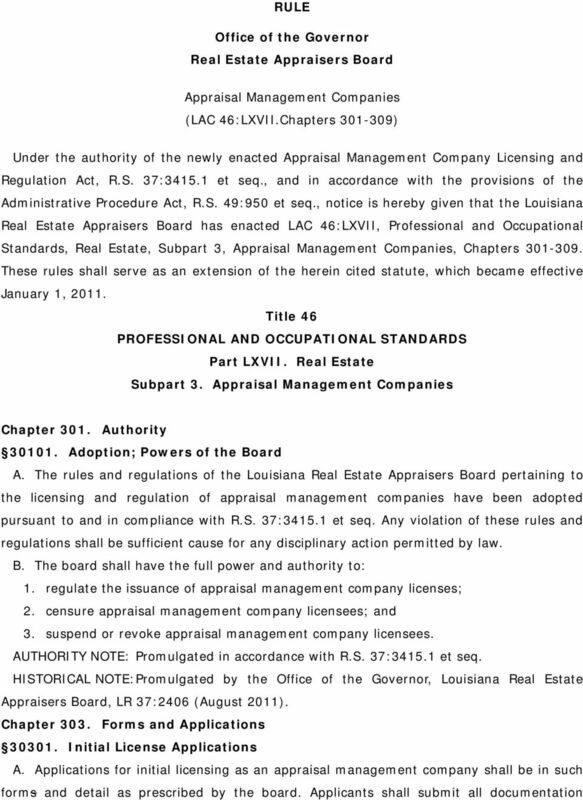 Appraisers Board, LR 37:2408 (August 2011) Exemptions to Prohibited Activities A. It shall not be deemed a prohibitive activity to: 1. provide an appraiser with a copy of the sales contract for a purchase transaction; 2. request additional information from an independent appraiser about the basis for a valuation; 3. request that an independent appraiser correct factual errors in an appraisal report; or 4. request that an independent appraiser provide further substantiation, detail, or explanation for the appraiser s value conclusion. Appraisers Board, LR 37:2408 (August 2011). 6 Chapter 309. Disciplinary Authority; Enforcement and Hearings Causes for Censure, Suspension, Revocation, or Denial of a License A. 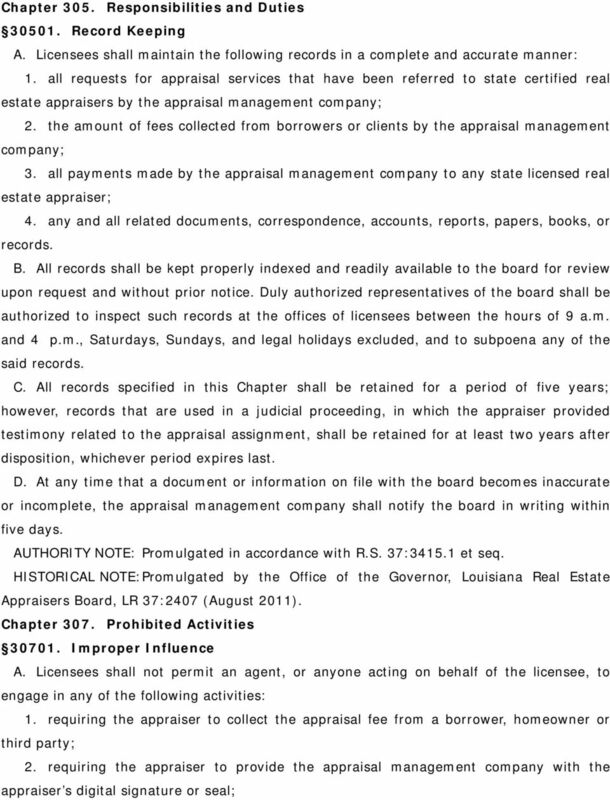 The Louisiana Real Estate Appraisers Board may censure, deny, suspend, or revoke an appraisal management company license, or may restrict or limit the activities of an appraisal management company or a person who owns an interest in or participates in the business of the appraisal management company, if the board finds that any of the following circumstances apply. 1. The application for licensing is found to contain statements that, in light of the circumstances under which they were made, are false or misleading with respect to a material fact. 2. 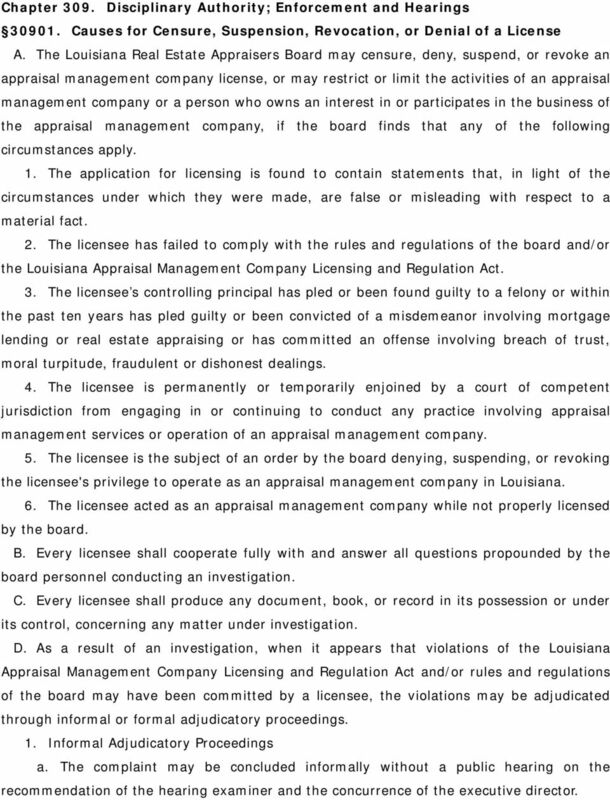 The licensee has failed to comply with the rules and regulations of the board and/or the Louisiana Appraisal Management Company Licensing and Regulation Act. 3. The licensee s controlling principal has pled or been found guilty to a felony or within the past ten years has pled guilty or been convicted of a misdemeanor involving mortgage lending or real estate appraising or has committed an offense involving breach of trust, moral turpitude, fraudulent or dishonest dealings. 4. The licensee is permanently or temporarily enjoined by a court of competent jurisdiction from engaging in or continuing to conduct any practice involving appraisal management services or operation of an appraisal management company. 5. The licensee is the subject of an order by the board denying, suspending, or revoking the licensee's privilege to operate as an appraisal management company in Louisiana. 6. The licensee acted as an appraisal management company while not properly licensed by the board. B. Every licensee shall cooperate fully with and answer all questions propounded by the board personnel conducting an investigation. C. Every licensee shall produce any document, book, or record in its possession or under its control, concerning any matter under investigation. 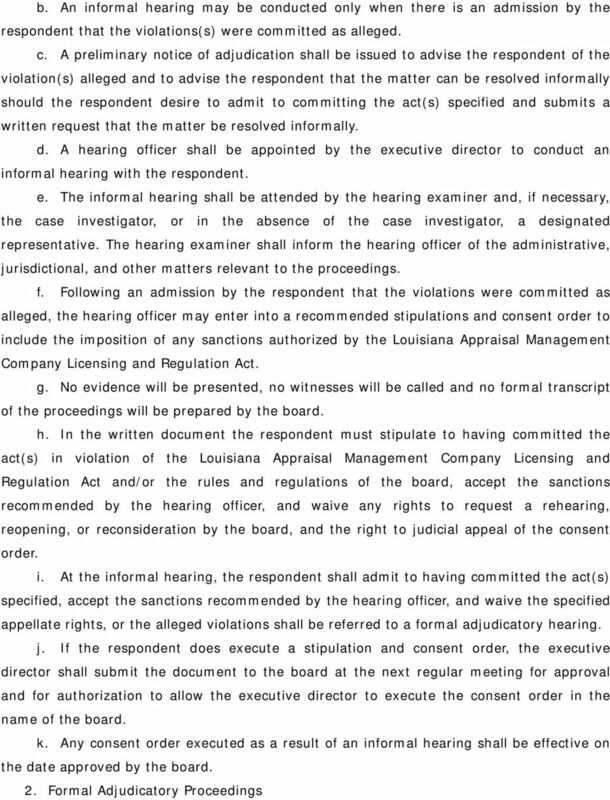 D. As a result of an investigation, when it appears that violations of the Louisiana Appraisal Management Company Licensing and Regulation Act and/or rules and regulations of the board may have been committed by a licensee, the violations may be adjudicated through informal or formal adjudicatory proceedings. 1. Informal Adjudicatory Proceedings a. The complaint may be concluded informally without a public hearing on the recommendation of the hearing examiner and the concurrence of the executive director. 8 a. All formal public adjudicatory hearings shall be conducted under the auspices of R.S. 37: and the Administrative Procedure Act. b. Board members who have provided technical assistance in any matter adjudicated at a formal adjudicatory proceeding shall recuse themselves and not participate in any portion of the proceedings. c. The order issued by the board pursuant to any formal public adjudicatory proceeding shall become effective on the eleventh day following the date the order is issued by the board and entered into the record at the proceedings. d. If a request for rehearing, reopening, or reconsideration of the order of the board is timely filed and denied by the board, the order shall become final on mailing of the notice of the board's final decision on the request. Appraisers Board, LR 37:2408 (August 2011) Appellate Proceedings A. Rehearings 1. An order of the board shall be subject to rehearing, reopening, or reconsideration by the board on receipt of a written request from a respondent. An application for rehearing, reopening, or reconsideration must be postmarked or received at the office of the board within 10 days from the date of entry of the order rendered by the board. 2. The date of entry is the date the order is issued by the board and entered into the record at the formal adjudicatory proceedings. 3. 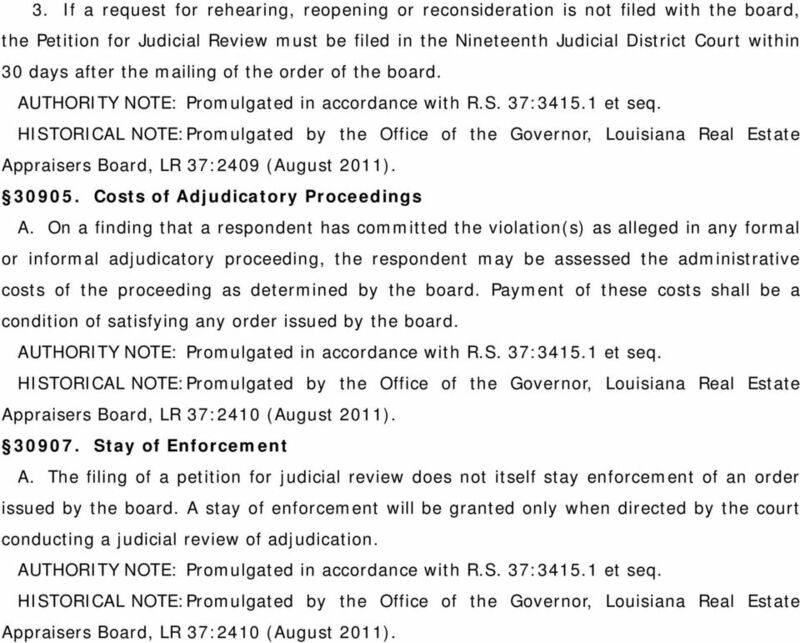 The request shall be reviewed by the board attorney for compliance with the Administrative Procedure Act. A finding by the board attorney that the request does not establish grounds for rehearing, reopening or reconsideration shall result in a denial of the request. B. Judicial Review 1. Proceedings for judicial review of an order issued by the board may be instituted by filing a Petition for Judicial Review in the Nineteenth Judicial District Court in the Parish of East Baton Rouge. 2. In the event a request for rehearing, reopening or reconsideration has been filed with the board, the party making the request shall have 30 days from the final decision on the request within which to file a Petition for Judicial Review. 9 3. If a request for rehearing, reopening or reconsideration is not filed with the board, the Petition for Judicial Review must be filed in the Nineteenth Judicial District Court within 30 days after the mailing of the order of the board. Appraisers Board, LR 37:2409 (August 2011) Costs of Adjudicatory Proceedings A. On a finding that a respondent has committed the violation(s) as alleged in any formal or informal adjudicatory proceeding, the respondent may be assessed the administrative costs of the proceeding as determined by the board. Payment of these costs shall be a condition of satisfying any order issued by the board. Appraisers Board, LR 37:2410 (August 2011) Stay of Enforcement A. The filing of a petition for judicial review does not itself stay enforcement of an order issued by the board. A stay of enforcement will be granted only when directed by the court conducting a judicial review of adjudication. Appraisers Board, LR 37:2410 (August 2011). MISSISSIPPI APPRAISAL MANAGEMENT COMPANY REGISTRATION ACT TABLE OF CONTENTS. 73-34-101. Short title [For effective date, see Editor's Note]. CHAPTER 43-40 OCCUPATIONAL THERAPISTS 43-40-01. Definitions. As used in this chapter, unless the context or subject matter otherwise requires: 1. "Board" means the board of occupational therapy practice. BY REPRESENTATIVES PINAC AND NEVERS AN ACT. services; to provide relative to the State Licensing Board for. and to provide for related matters. GENERAL ASSEMBLY OF NORTH CAROLINA SESSION 2009 SESSION LAW 2010-141 SENATE BILL 829 AN ACT TO REGULATE REAL ESTATE APPRAISAL MANAGEMENT COMPANIES. CHAPTER 10 - GENERAL LICENSING & LICENSING BOARDS ARTICLE 22 - LICENSING OF RESIDENTIAL CONTRACTORS SECTIONS: Section 10-22-101 to 199, inclusive. General Provisions. Section 10-22-101. License Required. Illinois Compiled Statutes. HIGHER EDUCATION (110 ILCS 1005/) Private College Act. Illinois Compiled Statutes HIGHER EDUCATION (110 ILCS 1005/) Private College Act. (110 ILCS 1005/0.01) (from Ch. 144, par. 120) Sec. 0.01. Short title. This Act may be cited as the Private College Act. APPENDIX ONE PHYSICAL ADDRESS The principle office and official address of the Board is as follows: Arkansas State Board of Public Accountancy, 101 East Capitol Avenue, Suite 450, Little Rock, AR 72201. PLEASE READ. The official text of New Jersey Statutes can be found through the home page of the New Jersey Legislature http://www.njleg.state.nj. The statutory basis for this rule entitled 1-1-2 Mortgage Loan Originator Temporary License, is section 12-61-910.3, C.R.S. This chapter shall be known and cited as the alarm systems code. The provisions of this chapter shall apply to the incorporated area of the city. CHAPTER 43-44 DIETITIANS AND NUTRITIONISTS 43-44-01. Definitions. As used in this chapter, unless the context or subject matter otherwise requires: 1. "Board" means the board of dietetic practice. 2. "Dietetics"